Are ruggers too focused on anaerobic training? Rugby is undeniably an anaerobic sport. Sprinting, tackling, scrummaging, and lifting and jumping in the lineout all utilize the two anaerobic energy pathways – the creatine phosphate system and the lactate system. The creatine phosphate system is your start-up energy system and uses adenosine triphosphate (ATP) and creatine phosphate (CP) stored in your muscles for energy. It’s used predominately during very short-but-intense activities such as a 20-meter sprint, and only lasts about ten seconds. The lactate system also uses ATP for energy, which is derived from partially oxidized glucose. This results in the production and accumulation of lactic acid which prevents further ATP production. The lactate system takes over from the CP system and lasts anywhere between 20-120 seconds depending on intensity. Because of this, most ruggers are very focused on their anaerobic training. That makes a lot of sense because, for any workout to be effective, it needs to be specific to the activity you are training for. That is the very essence of sports conditioning. Rugby is a sport of short sprints and other brief-but-intense activities, and therefore ruggers should include training that mirrors those demands. But does that mean all your rugby conditioning workouts should be anaerobic? Is aerobic training a waste of time for ruggers? Before you hang up your running shoes for good, it’s important to consider the role of the aerobic system in rugby. The aerobic system is your default energy system. It’s the system your body returns to after using either of your anaerobic systems. Because of this, it’s the foundation on which all other types of training are built. Despite this, a lot of ruggers fail to see the value of aerobic training. Here are five of the most note-worthy aerobic training benefits which will hopefully convince you to start including more aerobic training in your workouts. Your anaerobic threshold is the point at which you make the switch from aerobic energy production to aerobic energy production. This is usually around 90-95% of your maximum heart rate. The further back you can push this threshold, the later you’ll need to go “fully anaerobic” and the longer you’ll be able to sustain your efforts. The more aerobically fit you are, the later you’ll cross the anaerobic threshold. Think of crossing your anaerobic threshold like the reserve fuel tank on a motorbike. It’s much smaller than your main fuel tank, and so it won’t last very long. If you make your main fuel tank bigger, it’ll last longer so you won’t have to use your reserve tank so much or dip into it so deeply. Increasing aerobic fitness is like making your main fuel tank bigger so that you are less likely to empty your reserve tank as often. Even with improved aerobic fitness, you will still spend much of a rugby game in the grip of lactic acid. Because of the start/stop nature of rugby, your body gets plenty of opportunities to allow lactic acid to dissipate so that you can get back into the game. You might walk or jog, or simply stand with your hands on your thighs waiting to catch your breath. During these breaks from intense play, your body uses oxygen to break down and flush away lactic acid, and the more oxygen it can utilize, the more complete and time-efficient that breakdown will occur. Of course, the ref won’t stop play just so you can recover; you need to recover in whatever time there is between plays. Faster recovery is always better. The greater your aerobic fitness, the more efficiently your body will get rid of the accumulated lactic acid. Being aerobically fit means you have a denser network of capillaries round your muscles so more oxygen can get in and do its rejuvenating job. Your lungs are also more able to take oxygen in, and your heart is better at pumping it around. The faster and more completely your body can deal with the lactic acid, the quicker you’ll recover between bouts of anaerobic activity, and the sooner you’ll be able to get back into the game. Consider this: a set of hard squats will push you well into the lactate energy system, leaving your lungs heaving and your heart pounding. The more aerobically fit you are, the sooner you will be able to catch your breath and recover, and the sooner you’ll be able to do another set. If it takes five minutes for your heart and lungs to recover from a set of squats, your strength training will a) take longer than it should and b) be much less productive as your muscles will get too long a break between sets. Increased aerobic fitness is inextricably linked to better cardiovascular health. That might not seem very important to you right now, but as your heart is the most important muscle in your body, and heart attacks are all-too common in older (and sometimes overweight) ruggers, it’s something all players should consider before it’s too late. A decent level of aerobic fitness can significantly lower your blood pressure, your resting heart rate, and improve blood flow to your heart muscle. Coronary heart disease is the leading cause of death in the Western World, and rugby is a very strenuous sport that places a much greater-than-average stress on the myocardium. Being aerobically fit enhances blood flow to your heart, reducing your risk of CHD and increasing your longevity in the process. 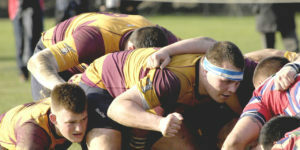 Body mass plays an important role in rugby, especially for forwards. The heavier you are, the harder you’ll be to push off the ball and the bigger you are, the easier it will be to physically dominate the opposition. However, if too much of that mass is body fat, you’ll have a tough job getting around the pitch and you’ll probably find yourself tiring more quickly. Aerobic training predominately uses fat for fuel which means it is a useful tool for weight management. Imagine how less tired and more mobile you’ll be if you shed some unwanted fat. Including more aerobic training in your weekly schedule will help. As well as recovering faster between bouts of anaerobic activity, aerobic training can enhance your recovery between rugby games and tough training sessions. Aerobic training increases oxygenated blood flow all around your body, and that will enhance recovery. In addition, some types of aerobic training are very low intensity and are essentially nothing more than active recovery. This can help ease sore, bruised muscles and minimize delayed onset muscle soreness – DOMS for short. There is more to aerobic training than just heading out for the occasional run or bike ride. You need to take a measured, progressive approach so that you can get the most from your training. There are four main training methods that every rugger should use to increase their aerobic fitness. Use them in rotation or as part of a periodized plan as preferred. 1) Long, slow distance training – also known as comfortable pace training, this type of workout is ideally suited for the day after an intense training session or rugby game. Exercise at around 60% of your maximum heart rate so that you are only slightly out breath. This type of training increases capillary density and builds low-end aerobic fitness. Example: Run for 45 minutes at a very easy pace. 2) Tempo/threshold training – for this type of training, you exercise at your highest sustainable aerobic pace, usually around 90% of your maximum heart rate, to increase your anaerobic threshold. In tempo/threshold training, if you go any faster, you’ll be forced to slow down as you dip into the lactate energy system. Being very intense, these workouts are usually quite short – 20 minutes or so being ideal. Example: Run or row 5,000 meters as fast as possible. 3) Fartlek – Swedish for speed play, Fartlek involves exercising a randomly-selected speeds for randomly-timed intervals. While Fartlek can involve anaerobic bursts, the majority of your training time should be aerobic. Example: Walk for a minute, run fast for four minutes, jog for two minutes, sprint for 30 seconds, run fast for another two minutes etc. – simply mix exercise speeds and the durations for the length of your workout e.g. 40 minutes. 4) Aerobic intervals – interval training is usually associated with anaerobic training, but it can be aerobic too. Aerobic intervals are invariably longer and slower, but the method is the same. Example: Run one mile at a moderate pace, rest half the time it took you to complete the mile, and then repeat. Do 3-6 intervals. While these methods all mention running, there is no reason to limit yourself to that particular form of training. In fact, as most ruggers are bigger and heavier than the average runner, they may find lots of running impractical and even uncomfortable. Check out our article Building a crazy cardio-base without running for rugger-friendly aerobic training alternatives. Aerobic training should be part of every rugger’s workout schedule. In many ways, it is the foundation on which anaerobic fitness and even strength is built. Most ruggers should do 2-3 aerobic training sessions per week, especially in the off-season. Lack of aerobic fitness could have a very detrimental effect on your training and playing performance. Get the most from whatever cardio workouts that you do by using BeetElite to boost stamina and endurance. Should I cut, bulk or maintain mass for rugby? Is it possible to lose weight and still be a Prop?